When many hands work together, even herculean tasks become simple. The collective and synchronized nature of our work has been the pillar of Salaam Baalak Trust's achievements. 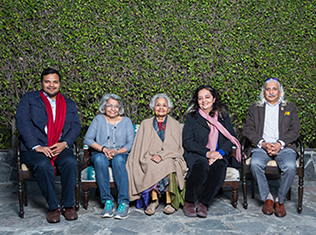 Making a humble beginning with three staff, Salaam Baalak Trust has now grown into a team of nearly 200, united by a clarity and commonality of thought and ideology. Trustees: The Trust is headed by a Board of Trustees. They constitute an integral part of the Salaam Baalak Trust team. The Trustees of SBT do not any honorarium or salary and still manage to invest quality time for the children and administration of the Trust. Their commitment and dedication stems from their keen interest and hands on involvement in the organisation's operation. This inspires the staff members to give their best. The Board of Trustees lead by example through their guidance and hands-on support. They ensure their participation in weekly Saturday meetings to get a detailed understanding of issues and problems faced, and facilitate the resolution of these issues. Trustee team is composed of Dr. Praveen Nair (Chairperson), Mr. Sanjoy Roy, Ms. Gagan Singh, Ms. Geetan Batra Tejpal, and Mr. Anubhav Nath. Dr. Praveen Nair is a Founder Trustee of SBT. Her daughter, Mira Nair’s film Salaam Bombay brought forth the harsh life of children living on the streets and motivated Ms. Nair to bring a difference to the lives of children living on the streets. Along with Sanjoy Roy, Ms. Nair established the Trust with three staff and 25 children in 1988. Her involvement in the development sector spans six decades during which she spent a considerable amount of time in Orissa and headed various development related committees for Red Cross, DAV Public School and Deaf and Dumb Association -- reaching thousands of children and families. Her resolve and continued commitment over the years has helped the Trust grow and expand to cater to a large number of street children. She has been a passionate advocate of street and working children’s rights in various policy and legislative forums of Delhi. Her intensive involvement in SBT’s operation has helped in formulation of child-centric policies and programmes. She has led the organization by example and her zeal and dedication to work for children motivates one and all at the Trust. Ms Nair’s contribution to the sector was recognized by the President of India when SBT was awarded the National Award for Child Welfare in 2011. She lives in Delhi with her two sons and their families and greatly looks forward to her great grandson’s visits from Bombay. Sanjoy Roy is the Managing Director of Teamwork Arts, a highly versatile production house with wide ranging interests in the performing and visual arts, social sector and films and television. He has directed and produced over 1000 hours of a wide range of films and television shows. An alumnus of St. Stephen’s College, New Delhi and has received the National Award for Excellence for Best Documentary and Best Director for the film ‘Shahjahanabad’. He is a Founder Trustee of SBT, and his creative pursuits have enabled SBT to integrate performing arts and theatre as one of the core programmatic components. Under his expert guidance and direction, children at SBT have prepared numerous plays and musicals and performed in India and overseas. Mr. Roy is an advisor on the arts for numerous governmental organizations across the world. He has also been instrumental in envisioning various advocacy initiatives of SBT and ensuring the representation of the Trust in child rights networks and bodies. He is married with two sons who are independent artists. Gagan Singh is the CEO, Business (India) and Sri Lanka (Operations), Jones Lang LaSalle India. A chartered and cost accountant by training, Gagan has enormous experience of resource and financial management of large corporate entities. She joined as trustee in 2002 and has been the driving force behind formalization of SBT’s financial and human resource policies and programmes. She greatly contributes to adoption of well-designed and structured budgetary, auditing and recruitment processes at the Trust, which has helped in ensuring transparency and accountability in fund utilization and financial transactions. Under her guidance the financial systems at SBT have become more organised and streamlined, and it is possible for the accounts department to provide specific details of fund allocation and utilisation under any and every programe of the Trust. A firm believer in women’s empowerment, Gagan is a mentor at Biz Divas, an NGO working on diversity and is the Vice President of Youthreach. She is also a board member of the Timex Group. Gagan is married with two daughters who are pursuing corporate careers. A recent grandmother, she cherishes spending time with her grandson. Geetan Batra has had many careers spanning a multiple range of interests and opportunities. A postgraduate in English Literature from Punjab University, she started as a journalist with the Indian Express and then went on to become the editor of the leading genre magazine, Indian Design and Interiors. Moving away from media she worked on several national and international art projects, involving traditional artisans and craftsmen. Understated and deeply empathetic she joined as an SBT trustee in 2010 and is deeply involved with multiple aspects of SBT’s functioning including children, staff, programmes and services. Her sensitive and caring attitude has enabled children and staff to establish strong bonds with her. She also plays a critical role in review of SBT’s publications and reports owing to her literary and documentation rigor. In the last few years, she has undertaken the renovation and running of old properties in the Himalayas and Goa as small boutique properties. Geetan is married with two daughters who work in cinema and in conservation. Anubhav Nath is director of Ojas Art and graduated from the University of Southern California, Los Angeles. He had been volunteering at SBT for five years before joining as the youngest trustee in 2013. He brings in a new and fresh perspective to the functioning of the Trust. His keen interest in arts has helped in fine-tuning the arts and vocational training programmes. He actively participates in planning and formulation of new strategies to make existing organizational practices more effective and efficient. In 2011, India Today magazine recognized him as a young change-maker of Delhi in recognition of his voluntary work at Delhi’s Tihar Jail. He is also a trustee of the Ramchander Nath Foundation and looks after a rare collection of vintage automobiles. He has written on art for various publications in India and overseas. A firm believer in effective mentorship, he is Contributing Editor, Maybach Foundation, and is involved in their documentation and archiving. He is a keen traveller and favors destinations with minimal Internet and mobile phone connectivity. Ms Parvati C. Patni has been working towards the care and protection of women & children in vulnerable circumstances for over a decade. An Alumnus of Delhi School of Social Work, she joined SBT in 2013. Parvati brings along with herself - skills of human resource management, capacity building, quality documentation and communication. A strong advocate of social inclusion, she strives to inculcate and foster the egalitarian and gender sensitive spirit of the Trust. With a doctorate in sociology, Dr. Mishra has completed 19 yrs in SBT. Popularly known as ‘Bhishmpitamah’ for his aged counsel and patience, Dr. Mishra has expertise in community mobilization and in training on legalities of child rights. He has trained over 200 police officers and Judges on JJ Act in various states of the country. An Alumnus of Banaras Hindu University, Mr. Tiwari has a masters degree in social work. He has been in SBT for over 18 years. A favourite among the children for his care and constant support, Mr Tiwari is also looked up to as a father figure for many. An expert in project implementation, he enjoys advocating the rights of child at various forums. He also carries the banner of SBT’s Arts programme. She is a part of the Salaam Baalak Trust family since the past 9 years. She had joined us as a psychologist intern and today, she is our mental health coordinator and a member of the executive council. She has a masters degree in psychology and is a certified arts-based therapist. Having a lot of experience in dealing and understanding mental health issues of children and adolescents, she makes sure to comprehend issues at the earliest. She has a strengths based approach and believes that every child has a spark. Apart from her profession, she is an avid reader and a traveler and always looks forward to exploring new possibilities. Coordinators: A specialised team of coordinators operate under the supervision of the Executive Council. Every residential centre and contact point is run by coordinators with the help of dedicated teams. Similarly, specific programmes viz., education, sports, mental health, Childline are also implemented by coordinators. Rest of the SBT Family: Apart of the management, the SBT family encompasses a trained and experienced cadre of social workers, medical social workers, teachers, accounts personnel, administration staff, counselors, tour guides, drivers and housekeeping staff. SBT is grateful to the specialised team of consultants, whose expert guidance is critical to the growth of children and Trust. A special mention of all the volunteers, who dedicate their time and share their skills for the welfare of our children. The key strengths of Salaam Baalak Trust staff team are as follows. Beyond the confines of a job description entailing fixed roles and responsibilities, each SBT staff member takes on varied tasks as and when required for the welfare of children. SBT staff works in different shifts, within office or in the field, building a rapport with multiple stakeholders and performing administrative as well as child-centric activities. Staff members shoulder multiple roles and responsibilities to complement and complete each other's work. For instance, in residential centres, social workers coordinate with the Child Welfare Committee (CWC), establish a friendly relationship with the children, and conduct informal sessions with them, imparting knowledge on social skills and etiquettes; counsellors, teachers and coordinators work together for all-round development of children. This ideal mix and match of skills, roles and responsibilities transforms into a working symphony. Keeping the principles of child participation in mind, the staff help the children explore their emotions and plan their future, through their education and vocational training. This level of involvement is only possible when our staff members feel they are an integral part of the SBT family, and are empowered to extend their own abilities and commitment. About 50% of the SBT staff has served the organisation for more than 10 years, which we consider a useful benchmark of employee satisfaction. The SBT team constitutes experts and skilled professionals from different disciplines. Trained social workers, teachers, mental health professionals, finance and account graduates and post graduates, along with sports and performing arts trainers, form a critical mass of human resources at SBT. This ideal mix and match of knowledge, skills and expertise transforms into a working symphony. Free flow of relevant information and clear communication channels are characteristic of transparency and accountability. SBT's Saturday meetings witness participation from trustees, executive council and staff representatives from all programmes and project units of SBT. The meetings serve as a solid platform to take stock of the work done, become privy to the problems faced at different levels, and devise collective solutions to these problems. The meetings bring all the SBT team members on a common footing, wherein they discuss the various issues and problems as equals. Staff members feel empowered, as their voices are not only heard, but trigger necessary action. Streamlined and organised financial systems at SBT also mirror organisational transparency and accountability. The financial records are maintained and updated regularly. These records and fund flow are examined and audited by independent external agencies and are available to everyone on the website. An organised system of purchase, procurement and storage through a centralized store mechanism, along with an established process of issue of receipts on receiving donation in cash and kind, further strengthens the transparency of SBT's financial management. Striking a balance between vertical and horizontal functioning has resulted in effective and efficient functioning of the SBT team. The vertical functioning, i.e. top to bottom approach, has been adopted to achieve clarity in lines of reporting and management and for well-defined communication channels, while a bottom-up approach has been established for actual implementation of programmes. Thus, the ground level staff reports to centre heads; centre heads report to the Executive Director and Executive Council, who then are accountable to the Trustees. However, at each of these levels, an optimum level of authority and flexibility is provided for smooth and effective functioning. The main objective is to encourage independent decision-making and problem solving at each stage of work, while keeping higher authorities in the loop. SBT allows room for individual and group creativity, and does not bind the staff members to rigid systems and protocols. The team members are encouraged to come up with their ideas of improving the current functioning of projects and programmes. Thus, staff members take initiative, and develop new strategies to engage with children and better the organisational functioning. Simple ideas, of screening movies or envisaging a comprehensive document on capturing good practices of the organisation are embraced by the Trustees and Executive Council, making staff members feel that they have the opportunity to dovetail their goals with organisational goals. These efforts of staff members are rewarded not only in words but in action as well. A former driver with his perseverance and skill has become a social worker, a social worker has gone on to become a centre head/coordinator and well-performing coordinators have been welcomed in as Executive Council members-these are some instances where SBT has clinched the desire of team members to initiate, innovate and improve. "Once Pramod, our Government railway police coordinator, jumped off a train running at full speed to protect a child who went missing from one of our homes. We were all in a state of shock and disbelief and asked why he endangered his life. He simply replied 'He was our boy; how could I leave him like that?' His statement brought so much respect in my heart for his commitment." "Salaam Baalak Trust is doing phenomenal work for homeless and destitute children with full dedication. The efforts to restore the children to their childhood are commendable. Salaam Baalak Trust is a nationally acclaimed organisation and as a donor we feel the transactions are done with complete transparency. The trust is doing excellent work by providing shelter, education, food and clothing to homeless children. Also, the active involvement of trustees and volunteers is wonderful to see."